Price is per two of these beautiful beads - large 22mm with largeish 2mm hole. Yellow Chinese dragon over the bead - dragon's bring luck & good feng shui. Both the dragon and yellow represent the Emperor in Imperial China! Decorative enamelwork in which metal filaments are fused to the surface of an object to outline a design that is filled in with enamel paste. Cloisonné is decorative enamelwork in which metal filaments are fused to the surface outlining a design filled in with enamel paste. Cloisonné enamelware dates back over 500 years in China. Being especially popular during part of the Ming Dynasty (mid 15th-centure). Owing to its brilliant colors and designs, cloisonné has been highly appraised around the world. Hand crafted by an elaborate and complicated process of hammering, soldering, enamel-filling, enamel firing, polishing and gilding. 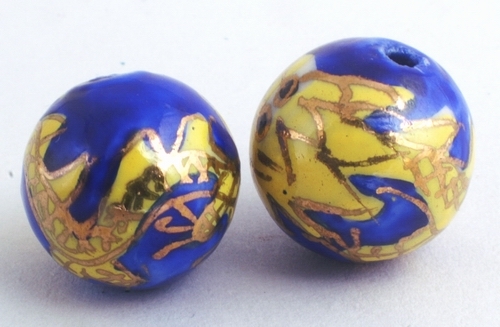 Cloisonné beads are no different in this process, and their energies are similar to those of flaked stone.